It is a difficult truth, a philosopher once observed, that dogs do not understand death. Cats are different; they have some strange portion of Eternity in their souls, and though death vexes and confuses them, they know more of it than most. But dogs are beings of the present moment, and they do not understand death. There are things that dogs understand very well. They understand running, and chewing, and jumping; they understand swimming, and barking, and growling; they understand love and loyalty and companionship. They also understand things which we sometimes appreciate less, such as the art of defecating and the pleasure of peeing, or the divine mystery of the shoe. In this, they are wiser than we are. Running across fields of tall grass. Jumping in snow. Eating that delicious turkey breast or that amazing shoe. Meeting others, fighting, playing, chasing, mating. Saving humans from the perils of strangers, being saved by humans from the perils of thunderstorms. Bright days, dark nights. Laughter, growling, scratching, baths, sniffing, sausages. This is their world. Why should any of it have to end? After so many days of running, why is running suddely more difficult? After so many years of eating, why does eating suddenly hurt? It is unimaginable that these changes are not temporary. Illness has come before, it will pass. There will always be more running. Running is what the world is for. You must know all this in order to grasp the nature of the Moddey Dhoo. For there are some dogs, some few dogs scattered across the ages and the worlds, that do understand death, and the Black Dog is one of them. It appears in many legends, some truer than others, and it is said that all who see it are doomed to die. But to fear it or condemn it as a demon, as some have done, is to misconceive its nature. 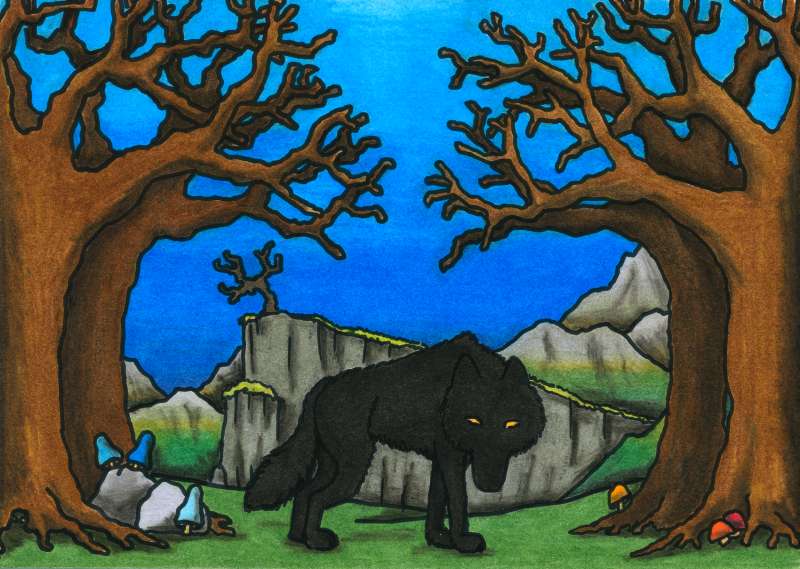 Like all dogs, the Moddey Dhoo wishes only to run and bark and growl and eat, to chase rabbits and howl at the moon. But it understands death, and so it seeks to warn us of it. It is not a demon, but a harbinger; a watcher, a hunter, a guard. If the Black Dog appears to you, its eyes burning in the night, its growl like distant thunder, treat it as you would treat any other dog. Be cautious, be kind. Feed it if it is hungry. Do not be afraid. You cannot avoid death. But for the time that remains to you, remember the pleasures of the dog. Run, eat, swim, mate. While you still can. At the end, the Moddey Dhoo will run with you. This entry in the Oneiropolis Compendium was made possible by Michelle Novellie.